Tween Tuesday is a weekly meme where I highlight books for tweens. 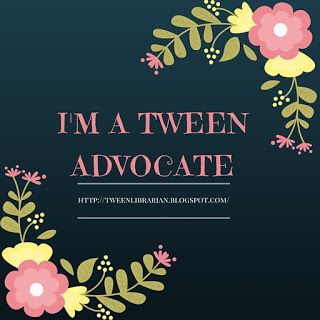 Add your Tween Tuesday link in the comments! About the Book: It's 1979 and Miranda's mom is gearing up to appear on the $20,000 Pyramid. Miranda is trying to deal with the sudden end of her friendship with her best friend Sal and immerses herself in her favorite book, A Wrinkle in Time. When Miranda starts to receive mysterious notes, she has to determine what she believes about time travel and what truly makes a friendship. GreenBeanTeenQueen Says: I read this book many months ago, but I've held off on blogging about it because I didn't find myself gushing over it like everyone else and I wanted to think about why. I enjoyed it, and I think it's a good read, and I'm featuring it on Tween Tuesday because I think some tweens will enjoy it. It just didn't strike me as a book that could have a huge tween audience. If you have a tween reader who has enjoyed books by Kate DiCamillo, Sharon Creech, or Katherine Patterson, I would give them this one. I was excited to read a book about time travel, especially one that featured a main character who was an avid reader and who was a fan of a book I loved as a tween. But unfortunately, I never felt like I connected to Miranda. She just never appealed to me. But, I'm also an adult, and I think readers who are in the same situation and trying to figure out friendships, may find solace in Miranda's struggles. I'm also a huge fan of time travel books, but I thought the time travel element never really worked. It felt very subtle to me, and since I was really looking forward to that aspect, it fell flat for me. I also wonder how much of the time period tween readers will understand-how many of them even know what the $20,000 Pyramid is? I did enjoy this one, I just wasn't blown away by it. It's a quick read and I think the author makes some great statements about friendships. I really enjoyed Miranda's friendship with Annemarie and I loved the relationship between Miranda's mom and her boyfriend Richard-her mom wasn't using him to get ahead or needed him financially, she could stand on her own, thank you very much. Really, I wouldn't be surprised if the Newbery buzz on this one comes true. It really struck me as a typical Newbery novel-one that adults, librarians and teachers love much more than the kids themselves. I'm not saying there won't be tweens who read this one and love it, I just don't think it will be adored as much by the tweens who read it. Maybe my expectations were too high after hearing it was amazing from so many people. Since every review I've seen of this one has come from an adult, I'd really love to hear a tween's reaction to this one! I was one that did love this one, but I understand all what you said. I think part of it for me was I didn't know it was a time travel book so it really was a shock to me! Great thoughts on it. I didn't know about the time travel going in and really enjoyed this. As the only kid in America to not enjoy A WRINKLE IN TIME, it was fun to learn to appreciate the story through another's eyes. For me, the parallels with A PRAYER FOR OWEN MEANY (a character destined for a specific task) made the story profound. I'll be honest, I adored this book. However I think your concerns about tweens liking it are totally valid. I'm sure there is a tween audience for it, it just won't be that wide. But yeah, definitely a book adults like perhaps more than the intended audience. I am SO glad I'm not the only who isn't in love with this book! I thought the whole sci-fi element was revealed so late that it didn't make sense or work. I loved WHEN YOU REACH ME. I used it as a read aloud with my 100 6th graders at the beginning of the year and they universally loved it!